I had also met Oscar Mathes, that grand gentleman and athlete of Lawrence, Mass., and also John Y. Smith who was trained by him. Professor P. H. Paulinetti also visited the gym frequently when he came to New York. 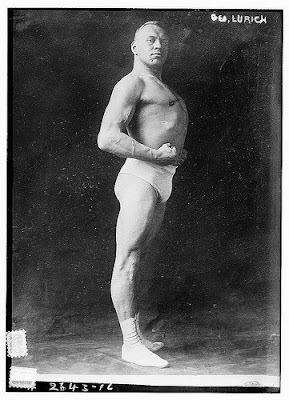 Both Mr. Mathes and Prof. Paulinetti wrote me very encouraging letters after seeing me perform at various shows, and though I would never class myself with the Great Sandow, both of these men wrote that my posing routine and muscle-control were comparable to Eugen Sandow’s, whom they had seen on several occasions. I also received a letter about this time from a group of boys in Hartford, announcing that they had formed the “Hartford “Siegmund Klein Bar-Bell Club.” Theodor Siebert, the old time German weight-lifting teacher, was kind enough to send me several of his books and mementos. The English “Health and Strength” magazine was conducting a posing contest, and having just had a new set of photographs taken by the New York photographer, Edwin Townsend, I mailed out a set of these pictures to the magazine as a contestant. A few weeks later I received a letter from the editor, wherein he stated that he was very much surprised that I had entered this contest, and wondered if I would be kind enough to withdraw my official entry and they in turn would make a special award by featuring me on a full page spread of the “Health and Strength” magazine, July 20, 1929. Speaking of my pictures appearing in the magazines of other countries, you cannot imagine my surprise when a complimentary copy of “Athletic India” was mailed to me with my picture on the cover! A feature writer of the “New Yorker” magazine called one afternoon for an interview with me for a department called “The Talk of the Town.” He did not of course know exactly in what week’s issue this article would appear. Purchasing the magazine a few weeks later, I started to read a story about Sig Klein. I could not for the moment connect this story with the interview I had given the reporter. As I reached the end of the article, I for the first time realized that I was reading a story about a Sig Klein who was conducting a “fat men’s” clothing shop on 14th Street in New York City. it was, I believe, a week later that my own story appeared in said magazine. I had always contemplated starting a little magazine for the members of the gymnasium and their friends, and being very enthusiastic about this venture, I informed Mark Berry of my plans. He in turn told Dan Redmond, the publisher of “Strength” magazine, of my intentions. I do not know what they thought I had in mind, but Berry made a special trip to New York and tried to dissuade me from publishing this little magazine, which I called “Klein’s Bell.” Not for a moment did I ever consider that I would be classed as publishing competitor in the weight lifting field, but they however considered me a definite threat. Immediately afterwards they published a new magazine called “The Strong Man” to discourage any plans that I may have had about ever placing this little magazine on the market. This new venture of theirs was a very well-thought-out plan, as their new magazine came out the same month as mine, June 1931. I published my magazine for 19 issues in all, and found that it was demanding too much of my time, as requests were coming in not only from this country but from all the English speaking countries of the world for it. Being primarily a bar-bell gymnasium instructor, I felt that I would be neglecting my pupils if I were to carry on with this publishing venture. Unlike many weight-lifters, I would not practice heavy weight lifting regularly. I was primarily a muscle culturist, but from time to time I would get enthusiastic about a lift and then would practice it, especially before a coming show. 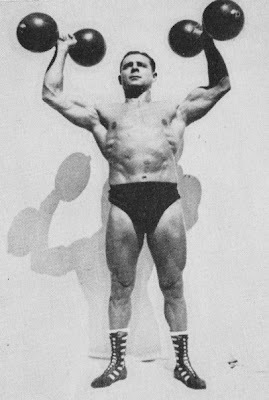 I was determined to make a new record in the Two Hands Military Press at a show to be held on January 3, 1931 at William Hermann’s Gymnasium in Philadelphia, so I started to practice for the event. Although there were only about 300 people in the audience at the show, I never had a more appreciative weight-lifting audience than the group that assembled there that evening. They gave me great encouragement. Whenever I lifted, particularly on the attempt that would decide if I would succeed in creating a new record, I would at that moment imagine that Attila was there too, encouraging me on. This had a terrific effect upon me. That evening, the first was 190 pounds, the second 199 ¾ pounds, the third 209 ¼ pounds. The bar was finally loaded to 220 pounds. I stood over the weight for a few seconds, steeled myself and pulled the weight to the chest, waited for the referee’s count to start the press, and slowly but steadily the weight was pressed up over head; then holding it there, I waited for the referee to count again, of one-two. While the weight was being pressed up the audience kept breathlessly silent. One could only hear the street cars rumbling by and the ringing of their bells. But when the weight was finally pressed out, the audience burst into one spontaneous and thunderous round of applause. Then the bar-bell was placed on the scale and it registered 221 ¼ pounds. I weighed 146 ½ pounds. A new World Record in the Two Arm Military Press was created. 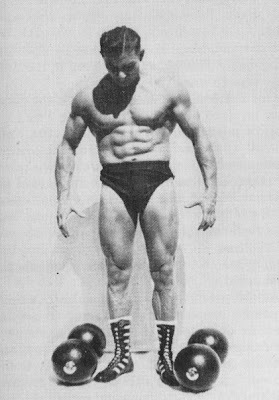 A new middleweight weight-lifter was now appearing at the various weight-lifting exhibitions in the person of Lynwood Lilly, better known as “Bill” Lilly. This young athlete was good at shoulder bridging, due to his exceptional flexibility and contortion ability. He could do well also on the other lifts. It was on September 9, 1900, that George Lurich, the Russian wrestler and weight-lifter created a new world record in what is known as the “Belly Toss,” where the bar-bell rests on the abdomen, the feet rest on the floor with legs bent, and with a sudden thrust, using the abdomen and arms simultaneously, the weight is tossed to arm’s length. Lurich succeeded with 443 pounds in this lift. Bill Lilly was out to break this record. He did succeed by lifting 483 ¾ pounds, but bridged up SLOWLY, very slowly, arching his back more and more, raising his abdomen to the height that his outstretched arms with the barbell would go, then lowered his abdomen so that he was again flat on his back, and supported this ponderous weight. Mark Berry announced at this show that a new record was created and surpassed the Lurich record. Henry Steinborn and I were present at this show and called Mr. Berry’s attention to the fact that although what we had seen Mr. Lilly just do was no doubt a most remarkable feat of strength, he did not perform the lift under the same rules nor technique that Lurich did, and I hastened to explain that I was very familiar with the lift, having read the rules and regulations about the lift in Professor Theodor Siebert’s German Weight Lifting book of records, “Der Kraftsport” or “The Strengthsport.” Mr. Berry, considered on or the outstanding writers and authorities in strength fields, could hardly retract what he had just announced about the record, and later wrote that there were at that show a “couple of jealous professionals present who tried to belittle his remarkable feat.” Far from it, Steinborn and I were two of the first people to congratulate Bill Lilly for this feat of strength. Back in New York, Steinborn and I became acquainted with one Dr. Schwartzer, who had trained with Lurich many, many times. I asked the good doctor if he would be kind enough to pay me a visit at the gym. He came a few days later, and after talking over “old-timers” I asked him about Lurich and the “Belly Toss” and asked him if he would be kind enough to take a bar-bell and demonstrate exactly how George Lurich did his lift. He did it exactly as it was described in Prof. Siebert’s book. I wrote Mr. Berry about this, but he would not correct the record that Lurich still rightfully holds, and allowed the Lilly record to stand.